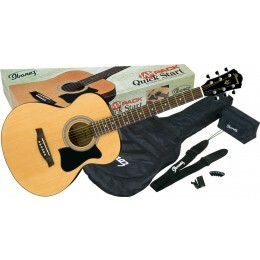 Our acoustic guitar packages come with all the basics you need to start playing. If you want to learn to play acoustic guitar it is best to buy from a specialist guitar store such as ourselves. All of our acoustic guitar packages come fully checked and properly set-up in our Glasgow Shop. This means you don't have to worry about high action and poor play-ability when you get it. Acoustic Guitar Packages. Everything you need including an excellent beginners guitar. 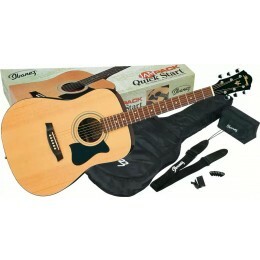 Every package includes an excellent beginners guitar. 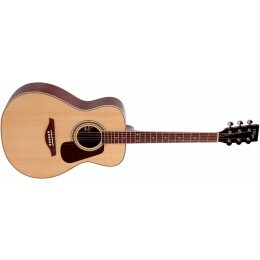 At Merchant City Music we offer a range of acoustic guitar packages for every budget. Every guitar we sell gets a full set up. No matter how inexpensive. This is extremely important when buying your first instrument. As well as selling manufacturer's own packs we also tailor make our own. 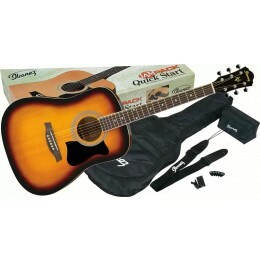 We have selected a range of products that are extremely handy when buying a beginners guitar. Our own specially made packs usually include a guitar tuner, cover bag, plectrums and spare strings. Please check on the individual package pages though to get the full package contents. Steel string acoustic or nylon string classical guitar? We sell both steel string acoustic guitars and nylon strung classical guitars. Merchant City Music have a selection of acoustic guitar packages with both. A couple of things to keep in mind between choosing between them. A steel string acoustic guitar has metal strings and is great for pretty much any type of music. They have plenty of volume and deliver a bright, zing-y tone. A classical guitar features a much fatter neck than a steel string and higher action. The nylon strings though are a bit softer on your fingers initially though. They are ideally suited to classical and Spanish styles of music. If you need any expert advice on buying acoustic guitar packages for beginners then please don not hesitate to contact us.